Why do all the great facilitators and party hosts build short and fast ice breakers into their sessions and social functions? I'll tell you why - because they work and have great impact. Here are my 5 big reasons why you should consider running an ice breaker game at the start of every meeting, party, social gathering, conference, club session etc. An ice breaker builds rapport quickly. A short and simple ice breaker has people interacting in ways that would be difficult and take a long time to otherwise. An ice breaker engages people and gives people something to do instead of waiting awkwardly for proceedings to begin. A well matched ice breaker prepares people for the main message of the day. An ice breaker is a powerful tool for the facilitator or leader. It enables people to learn more about you and gets people on your side. 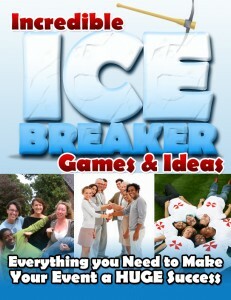 Never be without a ready to use selection of the most powerful ice breaker games from ice breaker ideas.com Bags of free ideas and our ice breaker collection available for immediate download.